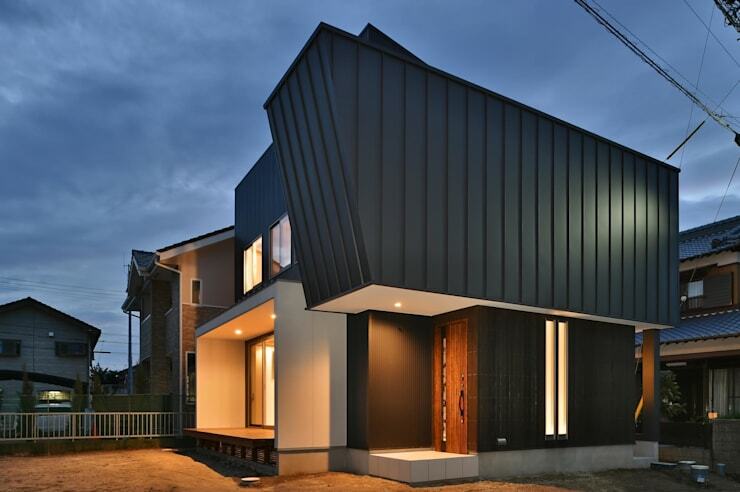 Designed by fabulous Wakayama Architects, today's home is a wonderful example of modern eclectic design. We are going to explore how this trendy and funky home comes together in perfect harmony thanks to careful attention to detail and an eye for style. As Janelle Monai said, I have not lost any of my crazy, fearless, raw, soulful, eclectic side and I plan on continuing to tell universal stories in an unforgettable way. Today we will see the value of eclectic design. Our first view of this home shows us just how impressive the architecture is. The whole house seems to be made out of industrial corrugated iron. That being said, it's not simply a hulk of a building that looks like an industrial warehouse. The designers have created a gorgeous piece of architecture, with volume and depth. This is offset by the large glass doors that open the home up as well as the rich, chocolate wooden door. You'll also notice that there are lots of glass windows in this home, making it clear that this isn't simply an industrial warehouse. This beautiful, eclectic home is industrial and dark on the outside and peaceful and light on the inside, with everything coming together in perfect harmony. 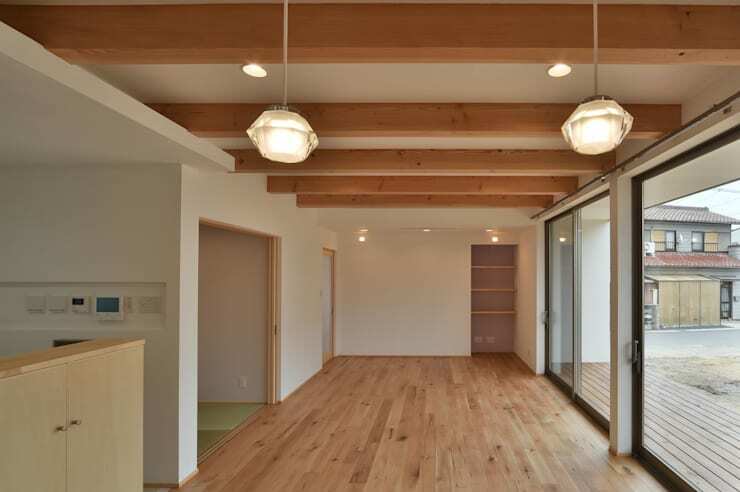 The light wooden floors match the light wooden beams, which contrast with the clean white walls. The interior is also light and airy thanks to the large, glass windows and doors. Two funky lights hang from the ceiling, providing a soft, gorgeous light in this living space. Check out these lighting ideas to brighten every room. 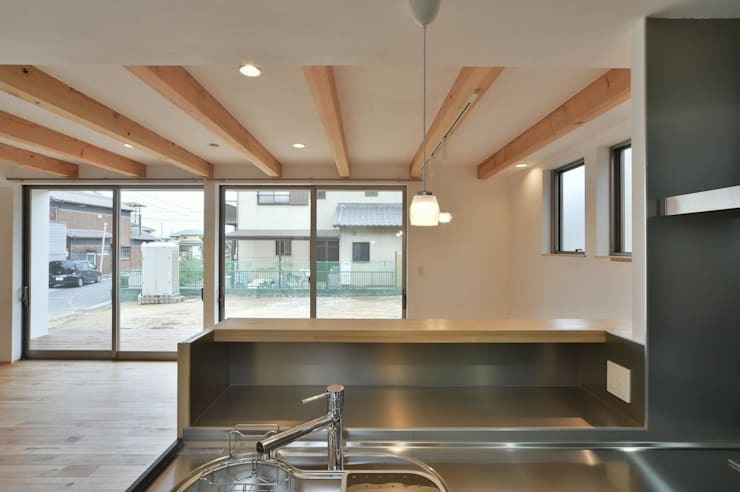 If we move into the kitchen, we can see that the ground floor is open plan, with a kitchen that is separated from the rest of the home by a neat little breakfast bar. This is a great design for a modern, family home as it allows for interaction no matter what part of the living space that you are in. You'll notice that there is a very minimalist design, with sleek silver appliances and a very simple design. This is all you need for a clean, trendy and functional space. If we spend some time looking at this area of the house, we can see how the designers have paid such close attention to detail. The staircase is intricately designed, winding up to the second floor. 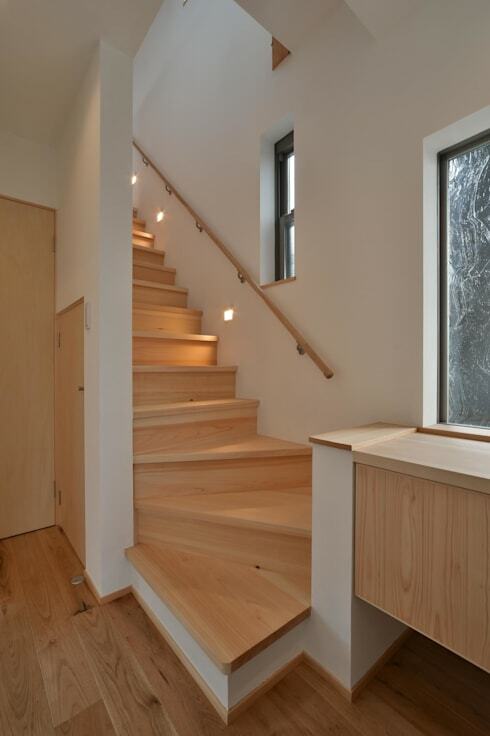 It is finished in a pale wood and features a simple wooden rail to help people get up and down the stairs. There are also windows, allowing plenty of light into this section of the home. You don't want a dark and dingy staircase! Have a look at our ideabook on: Wooden stairs: 6 jobs you can do yourself. Here we can see a little bit of creativity and colour seeping through into the design, with these lime walls. Just because a home is modern and minimalist, doesn't mean it can't pack a bit of a punch! 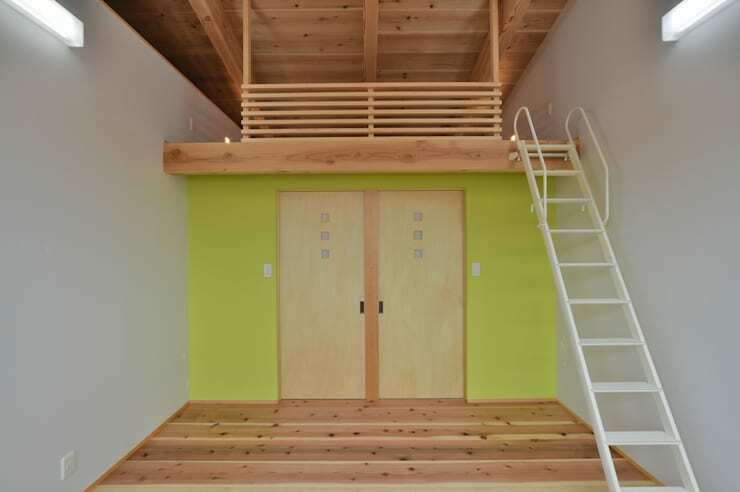 This section of the home leads up onto a loft area, with a trendy little white ladder connecting the lower and upper levels. Don't you think the green mixes up the look and feel of this space a little bit, making it more personal and warm? This design is perfect for a nursery or a kid's bedroom. Have a look through the homify range of kid's bedroom products for inspiration for your own home. We end off our tour looking at how impressive and gorgeous this home looks in the evening, with the lights shining softly throughout the exterior, enhancing the look and feel of the home—the perfect first impression. Lighting can make a huge impact on your home at night, so go for soft little lights like the designers have done here. 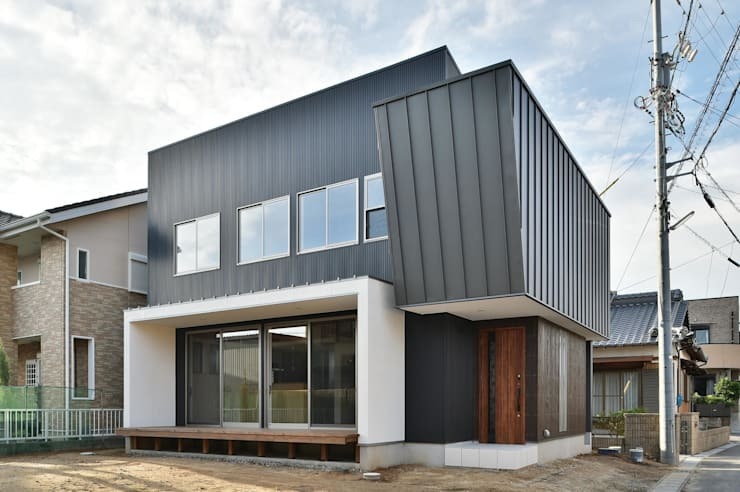 It's also important to note how modern homes like these are making more and more use of recycled materials and sustainable designs, which is why the corrugated iron used here is so important. It goes to show that recycled materials don't need to look cheap or rustic, in fact they can transform your home into a very sophisticated looking structure. Everything about this home is understated and superb! Would you live in a home like this?